Who among us wouldn’t have wanted a high-performance go-kart to play with when we were young? If you were a kid with those kinds of dreams, then the Mudhead 208R is the kind of go-kart that would’ve made your childhood. It’s a great addition to our youth line that provides the total off-roading experience for the youngest go-kart enthusiasts. 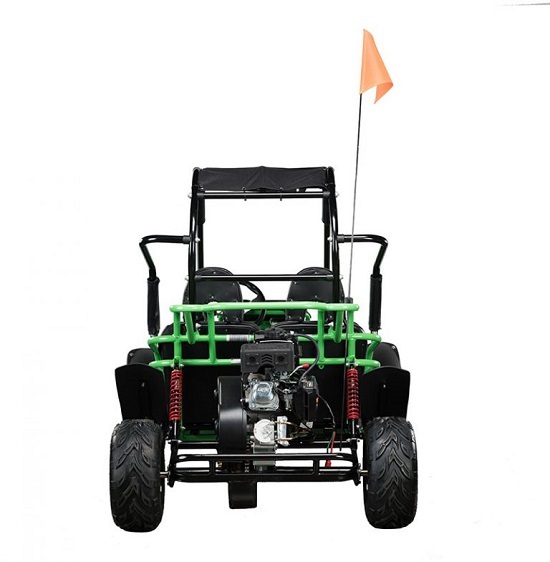 The Mudhead 208R comes with an automatic electric start with a pull start backup. It features a 208cc LCT power engine, all wheel fenders, dual LED headlights, adjustable seats, a horn, and a canopy style top. It also features an all-new reverse mechanism, which our original Mudhead model lacked. With six unique color choices, it also has a range of style previously unobtainable. Features like these are all comparable to the most popular full-sized racing go-karts, while still keeping the younger crowd in mind. It’s built to be fast and exciting, with just enough practicality and safety features to provide a reliably safe ride. There are few things that could excite a child more than a machine like this. Imagine how much fun your child would have with a two-seater go-kart of their very own. If it isn’t their favorite past-time, it’s still undoubtedly one of the best incentives for them to play outside this summer. At Hammerhead Off-Road, we strive to provide the best quality products with a focus on reliability, safety, and innovation. Visit us here to learn more and see everything else we have to offer.